Congrats went out from our Dive Centre on Gaya island in Kota Kinabalu late last week, as the two hard working divers we’ve had over the last couple of weeks achieved an important milestone. 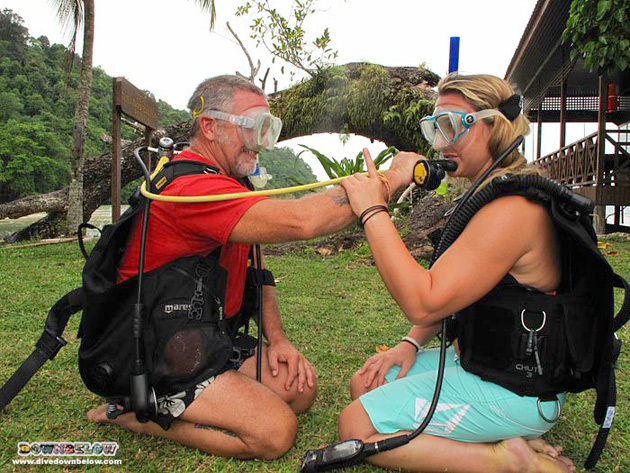 Brian and Melissa become professional divers with Downbelow, when they passed the Divemaster test at our PADI 5 Star IDC Dive Centre. Over the last fortnight they’ve been gaining experience, studying the required skills and honing their abilities. It was a proud moment for not just the 2 of them, but for resident PADI Course Director Richard Swann and his Go Pro team as well, when they achieved the first rung on the professional scuba diving ladder. Brian, who is a boat captain, and Melissa, one of his crew, will set sail shortly and take on the open seas, free to explore the best diving that Sabah and beyond has to offer, safe in the knowledge that they are now professional divers. Best of luck Divemasters, and bon voyage!